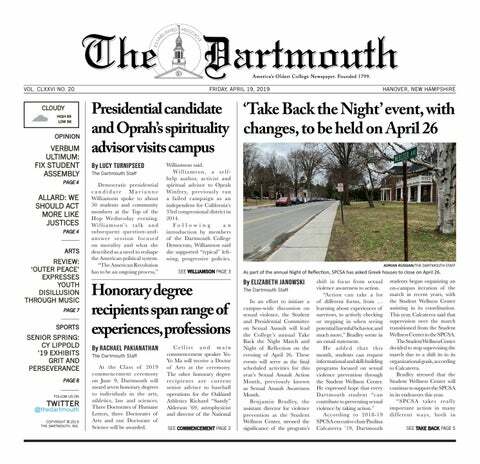 In its 250th year, how can Dartmouth recognize the failures of the past while celebrating its diverse present and future? “Indigenous Rising: An Evening of NextGen Native Artists,” an upcoming event at the Hopkins Center for the Arts featuring three Native American artists, is an exciting part of a new Hop initiative to represent more Native artists. Katie Wee ’19 is about as liberal arts as it gets: as a music major as well as a premed student, Wee’s experience at Dartmouth has crossed over disciplinary lines. Wee is a music major and plays violin in the Dartmouth Symphony Orchestra, serving as Concert Mistress on and off for the last two years. It’s an exciting time for film at Dartmouth: Ulrike Ottinger, the avant-garde German filmmaker, will be this fall’s Montgomery Fellow. Can a moped inspire change? Concept artist Eric Van Hove says yes. Opening on Sept. 18, “Mahjouba at Dartmouth: a Collaboration with Eric Van Hove,” an exhibit that will open at the Strauss Gallery in the Hopkin’s Center, explores the College’s relationship with the artist and his new project, the Mahjouba Initiative. Professor Lee Witters teaches both Dartmouth undergraduates and Geisel School of Medicine graduate students, specializing in the natural sciences and relating the sciences to his interests in humanism. The faculty of arts and sciences voted on May 7 to approve language drafted by the Committee on Instruction for new distributive requirements, which were first proposed in 2016 and which are set to go into effect as early as two years from now. The 2016 proposal consolidated the current distributives into four broad categories: Humanistic and Aesthetic Inquiry, Natural Scientific Inquiry, Social Scientific Inquiry and a more abstract Interdisciplinary Inquiry category.